When you see a bicycle moving closer, take your dog aside and wait while the bicycle will pass by. 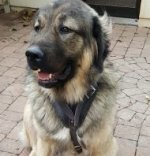 It doesn`t matter, whether the dog stands by your side, lies or sits - he knows better what pose it`s better to strike to cope with a situation easier. 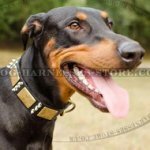 If the dog wallows on his back as soon as the bicycle passed, it means that the meeting with bicycle was unpleasant to him (when the dog wallows right after any event - it`s a sign of a stress). 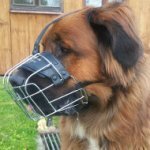 And if your dog becomes aggressive when sees a bicycle, then you need to take it under reliable control with a special dog outfit, such as a strong dog harness. 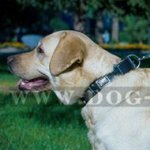 And what type of dog harness is the most suitable for handling your pet? 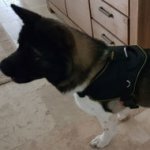 First of all, the harness should be made of a super solid material, like nylon or genuine leather, because nylon or leather dog harnesses are the best dog control items for strong and aggressive pets. 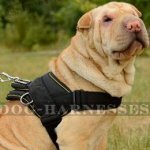 They are very durable, high resistant to dog pulling and very comfortable both for the dog and its handler. 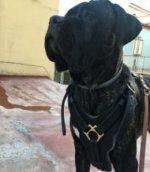 Second, when you choose a dog walking harness for your pet, pay attention to the side rings, because they will give you an additional control under your four-legged friend. 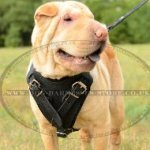 The best harnesses for dog easy walking, click on the pictures to see them! 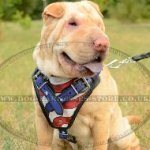 Hand Painted Leather Dog Harness "American Pride"